SETTING THE STAGE The walls of China’s first cities were built 4,000 years ago. This was at least 1,000 years after the walls of Ur, the great pyramids of Egypt, and the planned cities of the Indus Valley were built. Unlike the other three river valley civilizations, the civilization that began along one of China’s river systems continues to thrive today. Natural barriers somewhat isolated ancient China from all other civilizations. To China’s east lay the Yellow Sea, the East China Sea, and the Pacific Ocean. Mountain ranges and deserts dominate about two-thirds of China’s landmass. In west China lay the Taklimakan (TAH•kluh•muh•KAHN) Desert and the icy 15,000-foot Plateau of Tibet. To the southwest are the Himalayas. And to the north are the desolate Gobi Desert and the Mongolian Plateau. River Systems Two major river systems flow from the mountainous west to the Pacific Ocean. The Huang He (hwahng HUH), also known as the Yellow River, is found in the north. In central China, the Chang Jiang (chang jyhang), also called Yangtze (yang•SEE), flows east to the Yellow Sea. The Huang He, whose name means “yellow river,” deposits huge amounts of yellowish silt when it overflows its banks. This silt is actually fertile soil called loess (LOH•uhs), which is blown by the winds from deserts to the west and north. Environmental Challenges Like the other ancient civilizations in this chapter, China’s first civilization developed in a river valley. China, too, faced the dangers of floods—but its geographic isolation posed its own challenges. Because of China’s relative geographic isolation, early settlers had to supply their own goods rather than trading with outside peoples. China’s natural boundaries did not completely protect these settlers from outsiders. Invasions from the west and north occurred again and again in Chinese history. China’s Heartland Only about 10 percent of China’s land is suitable for farming. Much of the land lies within the small plain between the Huang He and the Chang Jiang in eastern China. This plain, known as the North China Plain, is China’s heartland. Throughout China’s long history, its political boundaries have expanded and contracted depending on the strength or weakness of its ruling families. Yet the heartland of China remained the center of its civilization. Fossil remains show that ancestors of modern humans lived in southwest China about 1.7 million years ago. In northern China near Beijing, a Homo erectus skeleton was found. Known as Peking man, his remains show that people settled the river valley as much as 500,000 years ago. The First Dynasties Even before the Sumerians settled in southern Mesopotamia, early Chinese cultures were building farming settlements along the Huang He. Around 2000 B.C., some of these settlements grew into China’s first cities. According to legend, the first Chinese dynasty, the Xia (shyah) Dynasty, emerged about this time. Its leader was an engineer and mathematician named Yu. His floodcontrol and irrigation projects helped tame the Huang He and its tributaries so that settlements could grow. The legend of Yu reflects the level of technology of a society making the transition to civilization. About the time the civilizations of Mesopotamia, Egypt, and the Indus Valley fell to outside invaders, a people called the Shang rose to power in northern China. The Shang Dynasty lasted from around 1700 B.C. to 1027 B.C. It was the first family of Chinese rulers to leave written records. The Shang kings built elaborate palaces and tombs that have been uncovered by archaeologists.The artifacts reveal much about Shang society. Shang Dynasty. Unlike the cities of the Indus Valley or Fertile Crescent, Anyang was built mainly of wood. The city stood in a forest clearing. The higher classes lived in timber-framed houses with walls of clay and straw. These houses lay inside the city walls. The peasants and craftspeople lived in huts outside the city. walls demonstrate the Shang rulers’ ability to raise and control large forces of workers. lengthy training to learn the techniques of driving and shooting from horse-drawn chariots. In the Chinese view, people who lived outside of Chinese civilization were barbarians. Because the Chinese saw their country as the center of the civilized world, their own name for China was the Middle Kingdom. and respect to the ruler of the Middle Kingdom, just as they did to the elders in their family. inferiors. They were expected to obey their fathers, their husbands, and later, their own sons. When a girl was between 13 and 16 years old, her marriage was arranged, and she moved into the house of her husband. Only by bearing sons for her husband’s family could she hope to improve her status. Social Classes Shang society was sharply divided between nobles and peasants. A ruling class of warrior-nobles headed by a king governed the Shang. These noble families owned the land. They governed the scattered villages within the Shang lands and sent tribute to the Shang ruler in exchange for local control. Religious Beliefs In China, the family was closely linked to religion. The Chinese believed that the spirits of family ancestors had the power to bring good fortuneor disaster to living members of the family. The Chinese did not regard these spirits as mighty gods. Rather, the spirits were more like troublesome or helpful neighbors who demanded attention and respect. Every family paid respect to the father’s ancestors and made sacrifices in their honor. hot poker to it, which caused it to crack. The priests then interpreted the cracks to see how the gods had answered. The Chinese system of writing had one major advantage. People in all parts of China could learn the same system of writing, even if their spoken languages were very different. Thus, the Chinese written language helped unify a large and diverse land, and made control much easier. needed to know at least 10,000 characters. For centuries, this severely limited the number of literate, educated Chinese. As a general rule, a nobleperson’s children learned to write, but peasant children did not. 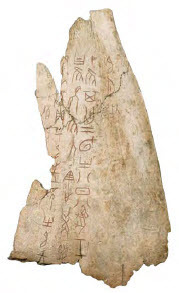 The earliest evidence of Chinese writing is seen on oracle bones like this one found in the city of Anyang. Around 1027 B.C., a people called the Zhou (joh) overthrew the Shang and established their own dynasty. The Zhou had adopted much of the Shang culture. Therefore, the change in dynasty did not bring sweeping cultural change. Nevertheless, Zhou rule brought new ideas to Chinese civilization. The Mandate of Heaven became central to the Chinese view of government. Floods, riots, and other calamities might be signs that the ancestral spirits were displeased with a king’s rule. In that case, the Mandate of Heaven might pass to another noble family. This was the Chinese explanation for rebellion, civil war, and the rise of a new dynasty. Historians describe the pattern of rise, decline, and replacement of dynasties as the dynastic cycle, shown above. and protection to the people who live on their estates. Similar systems would arise centuries later in both Japan and Europe. At first, the local lords lived in small walled towns and had to submit to the superior strength and control of the Zhou rulers. Gradually, however, the lords grew stronger as the towns grew into cities and expanded into the surrounding territory. Peoples who had been hostile toward the lords gradually accepted their rule and adopted Zhou ways. As a result, the local lords became less dependent on the king. More and more, they fought among themselves and with neighboring peoples for wealth and territory. Improvements in Technology and Trade The Zhou Dynasty produced many innovations. Roads and canals were built to stimulate trade and agriculture. Coined money was introduced, which further improved trade. Blast furnaces that produced cast iron were developed. Zhou cast iron production would not be matched in Europe until the Middle Ages. The Zhou used iron to create weapons, especially dagger-axes and swords. They also used it for common agricultural tools such as sickles, knives, and spades. Iron tools made farm work easier and more productive. The ability to grow more food helped Zhou farmers support thriving cities. These Chinese coins are made of bronze. Their shape resembles a digging tool such as a hoe or spade. A Period of Warring States The Zhou ruled from around 1027 to 256 B.C. The Zhou empire was generally peaceful and stable. Gradually, however, Zhou rule weakened. In 771 B.C., nomads from the north and west sacked the Zhou capital and murdered the Zhou monarch. A few members of the royal family escaped and set up a new capital at Luoyang. cycle was about to bring a new start to Chinese civilization.